Those looking to move beyond smartphone photography inevitably start considering digital SLR cameras. Beginners looking into DSLR cameras tend to check out the Big Two first: Nikon and Canon, and for good reason. These brands are well-established leaders in photography, particularly digital, making them a safe choice for new DSLR users. Nikon has a pretty loyal following, and with the perks and ease of use that come standard in their entry-level line-up, it’s fair to say they’ll keep gaining new converts. We ranked the best DSLR cameras for beginners and Nikon’s D3300 hit the top of our list. With a budget-friendly price and a compact size, the D3300 is an excellent choice for a budding shutterbug. The D3300 continues to be an attractive choice for new photographers for a number of reasons. For newbies, the interface and overall design are pretty intuitive, and the look and feel in general just make it easy to pick it up and start shooting. The auto features produce nice shots, which can get you by until you get the feel for the different settings and features. All of this combined makes for a DSLR that isn’t overly intimidating. It also makes for an attractive entry-level camera because the capture speed is good for this class of cameras. Many of those considering a move to DSLR are parents – the speed on the D3300 works pretty well for catching shots of those kids who just won’t sit still. Some of the extra features on the D3300 make it attractive to those target customers, too. The Effects modes, for example, offer some fun options like Super Vivid, Miniature, and Easy Panorama. Again, for beginners, this offers a ton of new potential. Shooting in Effects modes is easy, so it gives new users even more practice with this light-weight, intuitive camera. The D3300’s video feature is also a nice addition. Video shots look great and even end up being decent in low light. With 1080/60 HD, you’ll get sharp details and vibrant colors, and up to 20 minutes of video capture time. While any of the “best” DSLRs are going to produce consistent shot quality, the D3300 is good for beginners because of the consistency not just in shooting, but in use. Nikon’s technology is known for shooting quality at high ISOs, and the D3300 has a decent autofocus for being an entry-level camera. What this means for beginners is that you’ll see a lot of good practice shots even as you’re figuring out what all the terms mean and what the settings will do. Nikon’s cameras offer consistency across models, which makes for a relatively simple transition when upgrading to a higher model. Nikon has fairly good consistency with lens investments, too, so additional lenses or other accessories you purchase for the D3300 should carry forward (of course, always check with the manufacturer to be sure). Many photographers also keep the D3300 around even when they upgrade, or even purchase a D3300 as a backup. With great quality and plenty of features, professionals find the D3300 to be a nice addition to their lineup. Plus, the lighter weight and user-friendly body design provide a nice break from the much heavier higher-end models. There’s a lot to love about the D3300, and at the price point and given its lightweight feel, it will likely be a backup camera pros will actually use. 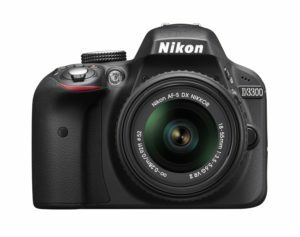 For individuals looking to make the move to DSLR, the Nikon D3300 is an excellent choice. It’s affordable, produces high-quality shots, and can shoot right out of the box.